View the MADCAP (Name Reserved) yacht photos below. Browsing the images will transport you to this distinctive luxury custom yacht, where you’ll discover her unique and brilliantly appointed accommodations and exterior spaces. Launched in 2010 by luxury yacht builder Newcastle Shipyards, with exterior styling and lines by M.G. Burvenich Designs and her interior design by . 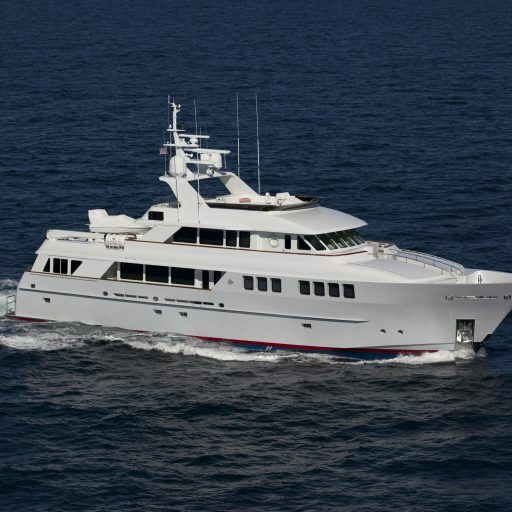 She is well equipped for a yacht of her size, sleeping up to 8 guests in 4 staterooms, with 5 crew. The MADCAP (Name Reserved) yacht photos showcase details that can only be found on a luxury yacht of this caliber. From marble-laden en suites, to immaculate furnishings and custom millwork – all of these select attributes come together to form 114 ft / 34.8 m of floating luxury travel. Accommodating 8 guests, each stateroom is inviting, comfortable, and features opulent accoutrements to meet all your needs. Enjoy quiet relaxation in the main salon or skylounge, and put your feet up as you take in the views. For additional information, select one of the options above. Here you will find more detailed information about the MADCAP (Name Reserved) yacht. To see if the MADCAP (Name Reserved) yacht is offered for charter and the weekly rate, view the MADCAP (Name Reserved) yacht charter price. In the event there are no MADCAP (Name Reserved) yacht photos or to request additional photos, please inquire. The experts at Merle Wood & Associates have relationships with yacht owners and captains of the most notable luxury yachts on the water, including those not publicly advertised. For further information, including a custom yacht report, simply contact a yacht broker at Merle Wood & Associates. Our expert team of yacht specialists offer more than 250 years of combined experience representing yachts for sale, both luxury motor yachts and sailing yachts, worldwide. The MADCAP (Name Reserved) yacht photos & video have been compiled and arranged to provide our visitors the most current and accurate content for the luxury yacht MADCAP (Name Reserved). If you would like to report an error or have additional photos or video, of the MADCAP (Name Reserved), please contact our luxury yacht intelligence team.